Walking with Tica (and now Sylvia): Thanks, neighbors! 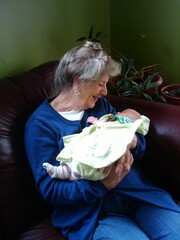 Judith Edwards welcomes Sylvia to Beacon Hill. Photo by melissajonas. Tica’s walks are a little slower and a little shorter than they used to be. She also has to share the smiles and praise our neighbors generously dole out. On May 14, we added a third person to our family: Sylvia Grace Foster. Gifts and well wishes started arriving before we even brought her home, thanks to the “doggy grapevine.” The neighbors who walked Tica while Sylvia was being born shared the news of her birth with all our doggy friends. We arrived home to a warm welcome! Sylvia is napping in one of the many adorable outfits Heather passed down from her kids. I’m enjoying a hot bowl of chicken vegetable soup while the baby sleeps—courtesy of our neighbor Georgia. Judith’s potato soup waits in the freezer for another cool day; I devoured the chicken rice ambrosia as soon as she left it on the porch. Other neighbors have shared gifts, food, support, and tips for raising a baby in Beacon Hill—thanks to you all! Beacon Hill businesses have also been welcoming, generous, and patient with our new baby. Sylvia’s first outing was to the newly opened The Station, where Luis greeted her like family. We strolled to the Beacon Hill Festival and had lunch afterwards at Baja Bistro and dinner a few days later at La Cabaña (impossible to say which is more family/baby friendly). Already, we’ve enjoyed two Beacon Rocks! events, visited the library multiple times, and been granted the royal treatment at Red Apple. Sylvia ogles other babies smaller than watermelons at McPherson’s, and enjoys attention from the big kids in strollers at Beacon Hill Office and Mail Center. I’m looking forward to seeing everyone at the Piñata Party next Saturday! Many thanks to all the wonderful, amazing, generous, thoughtful people who have welcoming Sylvia to Beacon Hill. I hope she always appreciates how fortunate we are to live in this community. Photo by Invisible Hour, via Creative Commons. When I was cruising the internet 10 years ago searching for the perfect canine companion, I looked forward to having a fuzzy head keep my feet warm on the couch and planned the cool tricks I would teach my new pal. I also started jogging a few weeks in advance, so that I would be in better shape to tire out an energetic young dog (ha!). 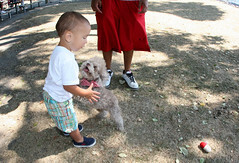 I researched food, off-leash areas, doggy daycares and dog walkers. What I didn’t realize was that over the years, I would get to know every tree and front flower garden in the neighborhood. I’ve learned where the dogs live and where the cats like to hide. While Tica sniffs, I read the “for sale” and “lost bike” signs on the telephone poles. We’ve watched babies grow into kindergardeners. Walking with Tica has shaped the way I interact with my community. I enjoy casual (and sometimes lengthier) conversations with neighbors—mostly those who spend a lot of time outside, like the dog owners and avid gardeners. Walking with a dog provides an opening for conversation, sort of a secret handshake. People stop and smile and start conversations. People reach into their pockets (or go into their houses) to share a treat with Tica. We exchange cookies during the holidays and keep an eye on each other’s homes on vacation. It shouldn’t have surprised me that growing a baby brings out the same responses in people. I’m getting to know an entirely different group of neighbors—the grandmas, the moms without dogs, older kids who feel safe making eye contact with a mom-to-be. The always friendly library staff and Red Apple cashiers are absolutely bubbly. People who usually walk quickly from their car to the front door linger on the sidewalk to say hello, ask how I’m doing, or offer baby items. I’m amazed by the generosity of our neighborhood. Thank you to all the neighbors who’ve shared baby items, support, and yummy snacks! Here are some Beacon Hill area parenting resources and places to donate or sell your baby/kid gear. More experienced parents, please add your suggestions in the comments. Have you ever searched “Beacon Hill” on craigslist? I’ve gotten several baby items in perfect condition at a great price. Best of all, I got to meet new neighbors with kids, within walking distance of home! El Centro de La Raza, 2524 16th Avenue South, (206) 329-7960. 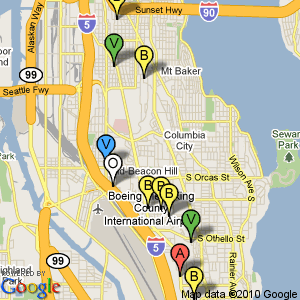 Beacon Ave Food Bank, 6230 Beacon Avenue South, (206) 722-5105. If you’d like to donate children’s items or know a family in need, Wellspring Family Services operates the Baby Boutique. Their “urgent needs” wishlist includes: carseats, maternity clothes, shoes, and personal care items (shampoo, lotion, etc). The Baby Boutique serves kids of all ages, from newborn to teenager. Baby Boutique accepts donations on the following days and times: Tuesday 10:00 am – 7:00 pm; Wednesday thru Friday 10:00 am – 3:00 pm; 2nd and 4th Saturday of the month 10:00 am – 2:00 pm; or call 206-902-4270 to set up an appointment. Due to limited space, they cannot accept items larger than cribs or toddler beds. I’m just getting started with the North Beacon Hill Parents yahoo group. It seems to be a good place to give away/sell kid items and post questions about everything from preschools to replacing old wood windows. I’m looking forward to interacting more with this group. Seattle Humane Society offers assistance to low income pet owners. Rainier Veterinary Hospital is not a non-profit, but they do help people and pets in need. 815 Rainier Avenue South, (206) 324-4144. 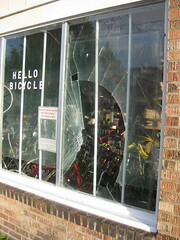 Over the last weekend in February, someone smashed the front window at Hello Bicycle. Photo by dreaming_of_rivers, from the BHB Flickr photo pool. Here are some selected reports sent to us, appearing on the mailing lists, or in the scanner logs at bhnw.org. 2/23 12:15pm, Swift and Albro — Boy throwing rocks at northbound cars on the freeway. If you didn’t read the comments in the Thanksgiving pie post a couple of days ago, you missed the announcement of a brand-new Beacon Hill resident. Welcome to Stella Rose Hill-Stach, born at 5:09 pm on Tuesday, November 25 to Tyler and Sarah! Congratulations to the happy parents! Heather and Sarah of Buggy, your local baby feed & tack, are pleased to invite the neighborhood to help celebrate Buggy’s first birthday tomorrow, Sunday, October 12th. There will be live music by Brian Vogan, as well as free cupcakes and coffee. The celebrating starts at 11:30am. Buggy is located at 3315 Beacon Avenue South. For more information, call 206-325-5999. Thanks to Sarah for the announcement list posting!